Here is Salley Knott Westcott's thank-you note. "Simply Weddings....Thank you for an absolutely perfect 20th anniversary vow renewal ceremony. We could not have asked for a more perfect day. Avonly Beach was just the right location. Joy, Maria and Tony were all fantastic and I felt as though we were amongst friends to celebrate our special day. The flowers, champagne and cake were what I would have chosen on my own. The cherry on top was seeing an email from Joy 2 days after our ceremony with a small sample of photos that were taken during our ceremony. Excellent service! I get teary thinking about how romantic and special our ceremony was and how we were lucky enough to mark this milestone in such a beautiful place. 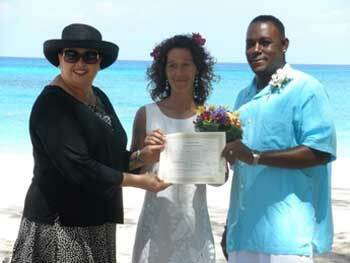 I would highly recommend Simply Weddings if you wish to get married or renew your vows in lovely Cayman. I am happy to answer any questions. Feel free to message me." Here is Ashley Pope's thank-you note. "Simply Weddings was simply on top of things last week for our vow renewal. They had bad waves (some kinda storm) where we would normally come into port and we had to go to the back of the island where there is absolutely nothing! I was really nervous because Joy was suppose to pick us up in George Town. 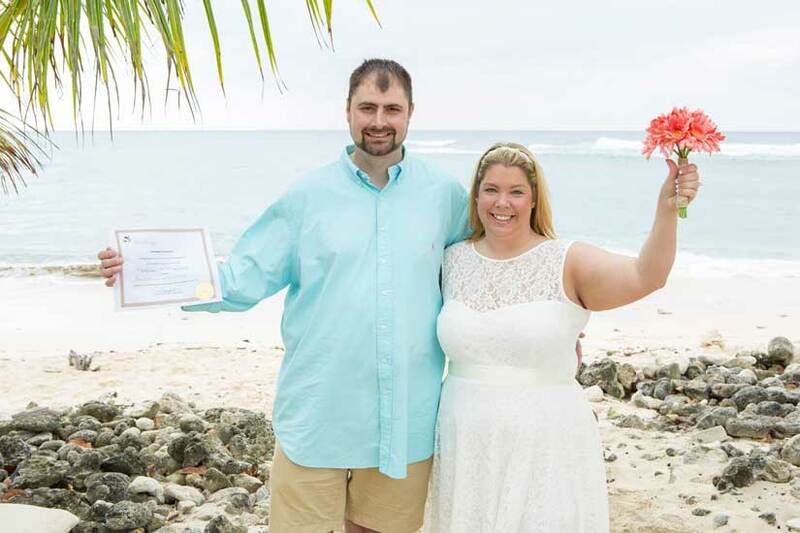 We contacted her by phone on the ship and she already had made plans to pick us up on the other side of the island and had also contacted Julie, our photographer at DeepBlueImages and gave her the change of plans. We didn't get to do our ceremony at Smith Cove like we wanted but Joy took us to Surfer's Beach which was almost as beautiful. It rained all during our photography session and the majority of our ceremony (everyone says rain on your wedding day is good luck) my hair ended up being a mess but I think all in all it was a success. Thank you so much Simply Weddings for making our renewal so memorable." Here is Teena Chavez's thank-you note. "I'd like to thank you for helping to create a wonderful and memorable wedding day. Your team is amazing and a delight to work with. You all helped to create a perfect experience." Here is Michelle Harrell’s thank-you note, in her own words. "Could not have had a more perfect wedding on the beach. Joy, Sam, Maria and Denny helped make our wedding absolutely perfect. My husband surprised me with a ring, a dress and the wedding when we got here for vacation. It is something I will cherish forever! Great job guys! And a HUGE thank you!!!" Here is Debra Vaughan Mueller's thank-you note. "We could not have asked for a more perfect wedding. It was more than We could have ever dreamed of. Joy, Sam and Maria were fantastic they did everything we wanted and more. Planning our wedding with Simply Weddings was so much fun and stress-free. I want to thank you all so much for making our day so amazingly perfect. We hope to see you again soon." Here is Jennifer Poliskie's thank-you note. "We could not have asked for a more perfect, gorgeous day. Joy, Sam, Maria, Dennie and the whole staff of Simply Weddings were fantastic. Planning a wedding is stressful enough, but to attempt to plan it a couple thousand miles away seemed impossible. Simply Weddings was amazing. They made it simple, stress-free and absolutely beautiful." Thank you for making our day so special and amazing! Here is Jessica Foyil Poliskie's thank-you note. "We could not have asked for a better experience. Joy customized many details for us and made us feel so special, we had a large group of 21 people total and all we can hear from them all is how beautiful the venue and ceremony were. We have already decided that we will be returning to the beautiful Cayman Islands on our anniversary." Thank you Joy for creating the most beautiful wedding and crating memories that will last a lifetime. Here is Paula Smiley's thank-you note. Joy, Sam, Maria, and Denny made our day so very special. My husband and I eloped (with our family's blessing) but we never felt alone or lonely on that day. The Simply Weddings team is simply amazing! I'm grateful that we chose them to plan our very special day! We can't wait to go back and renew our vows! Here is Blaney Teal's thank-you note. "Joy made our special day so easy for us! One stop shop! All the details were taken care of for us! All we had to do was show up (dressed of course!) The photographer and hair and make up artist she arranged were amazing as well! Tim and I have some very special memories and photos to prove it!" Here is Shellie Hagquist's thank-you note. This is the best place to get married if u are around this area! Had the most amazing wedding here ! Loved everyone that worked for this company! Awesome !!! Here is Mayra Swaby's thank-you note. My wedding was perfect, they made the process so easy. On our wedding day she was super professional and very accommodating with us. Thanks a lot Simply Weddings!! Here is Victoria Miller's thank-you note. My husband & I were married on July 8th at Smith Cove. I could not imagine having a wedding any other way. I was beyond relaxed. Everything was handled for me. No stress at all! Simply Weddings is Amazing! Here is Shirley Gregory's thank-you note. "Perfect! We could not have been happier! Absolutely gorgeous Ceremony! Thank you Joy, Sam, Maria, and Hayley- you was my lil Angel! We were so blessed to have met you all! Forever in our memories!" Here is Mariechen Lorenz's thank-you note. "The best we ever did ! Thanks a lot for make our dream come true! Für alle deutschsprachigen: Wir haben alles richtig gemacht,wir hatten so eine entspannte und unvergessliche Hochzeit,dank Joy und ihrem Team!" "I am a very happy groom and I also have a very happy bride and it is all because of Joy Basdeo and her lovely assistant Peggy. When we arrived in Cayman everything went off without a hitch. Joy was very helpful in working with us over a period of months through e-mails and phone calls. She really made us feel comfortable with the planning of our special day. Everything was so personal and relaxing. 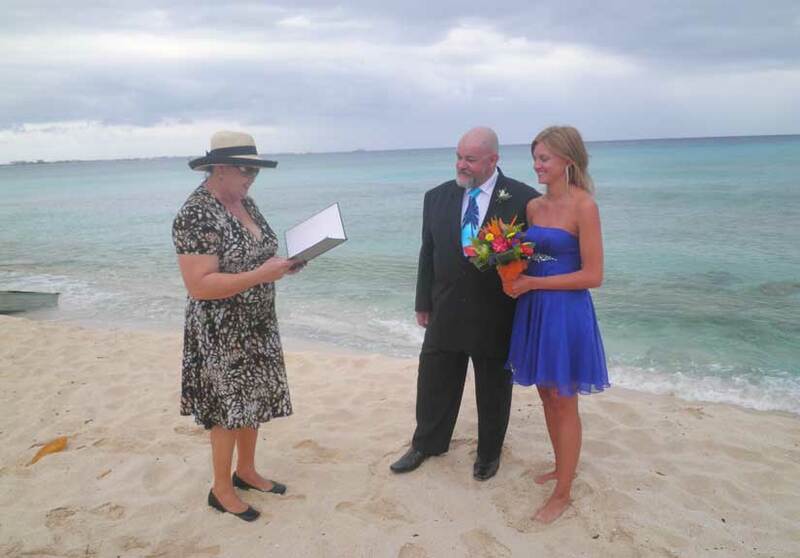 I would recommend Simply Weddings to anyone that is getting married in Grand Cayman Islands. After wrestling with Carnival about their ungodly prices for a simple wedding I was glad to find Joy. Just wanted to throw in that Carnival had five weddings that day and they did them all together so I would have been pissed if I had to share my special day with four other couples. So don't trust the cruise ship weddings but you can trust Joy of Simply Weddings to keep things honest and straight forward. My bride was very happy and all she kept saying was "This is the best day of my life." And from the grooms point of view it was well worth it having a happy non-complaining bride for the remainder of the cruise. You go Joy!!!!! keep up the beautiful work that you do and my family and I will never forget you or The Cayman Islands." Thank-You for doing such a great job and Thank-You for allowing my parents to use your Parents vows. Again, thank you so much and we hope to see you again sometime maybe in Atlantic City or Las Vegas. Have a wonderful New Year. We just can't thank you enough for everything you have done to bring us to this day. From the endless info on your blog to your emails, even when on vacation, WOW!! We firmly believe that everything happens for a reason, and working with you has been a true gift. Please use this money and buy a new hat. When you wear it, smile and think of the many times you made us smile during this process. "Zack and I cannot thank you enough for THE most WONDERFUL wedding we could have ever imagined. The location, the ceremony, your words made our day unforgettable. I couldn't have asked for a more beautiful memory and will hold your words to heart." Roy and I want to thank you so very much for all that you did to make our wedding perfect. The setting was beautiful and the ceremony was the best. Not having family and friends there was how we wanted it but still was hard. You and your husband and Fevi made it seem like we were with family. We hope to come back in the near future and will be sure to look you up." "Thank you so much for officiating our wedding and making the day wonderful for us. A romance that spanned across the globe starting with the meeting at the Greece Olympics, travelling to Europe again to meet each other then with Steve coming to Aus to ask for my hand in marriage and us settling in New York for now. Citizens of the universe 🙂 Maybe a Hollywood movie one day! None of us really wanted to leave the Cayman Islands and are hoping to come back again in the future. Thank you again for all your help." " Rajka and I would like to thank you guys for everything. It was great...I would highly recommend your services to anyone.